Notice: None of this was endorsed by The Day-Dream. However. The light of rebellion was ablaze in someone's eyes (*cough* Amy *cough*), so I reposted. Enjoy! "... saving one the trouble of thinking for oneself, always a laborious business." Today is Percy Day, as proclaimed by the lovely Anne-girl of Scribblings of my Pen, and so in celebration of this auspicious occasion we would like to share with you some of our favorite TSP quotes. Quotes by and about Percy, naturally. This is, of course, by no means an exhaustive list. Please do comment with YOUR favorites! Blakeney watched him for a moment or two without speaking. His face through all the grime and disfigurement wore that expression of infinite sympathy and understanding of which he, of all men, appeared to hold the secret, the understanding of other people's troubles and difficulties, and that wordless sympathy which had so endeared him to his friends. "Help you, my dear fellow," he now said. "Of course, we'll all help you, if you want us. What are we here for but to help each other, as well as those poor wretches who are in trouble through no fault of their own?" "Ah?" quoth Sir Percy airily. "The inevitable has always been such a good friend to me." But remember that in life there is always one supreme moment when Chance--who is credited to have but one hair on her head--stands by you for a brief space of time; sometimes that space is infintitesimal-- one minute, a few seconds--just the time to seize Chance by that one hair. I love you with my whole soul, with every fibre of my being, more than life and eternity, but I could not love you, dear, so much, loved I not honour more. With the help of my faithful lieutenants I will bring those defenceless women safely to England according to my pledged word, then my arms will close again around you and you will feel my whole soul in a kiss. He had no need to tell her that duty and friendship called, that the call of honour was once again—as it so often has been in the world—louder than that of love. She understood and she knew, and he, with that supersensitive instinct of his, understood the heroic effort which she made. "A man talking to himself is ever in a sorry plight... he is either a mad man or a fool." "Which would have been a pity, my dear M. Chambertin," Blakeney rejoined gravely. "I should not like you to forget me. Believe me, I have enjoyed life so much these past two years, I would not give up those pleasures even for that of seeing you and your friends have a bath or wear tidy buckles on your boots." "You will have cause to indulge in those pleasures within the next few days, Sir Percy," Chauvelin rejoined drily. "What?" Sir Percy exclaimed. "The Committee of Public Safety going to have a bath? Or the Revolutionary Tribunal? Which?" "Nay, my friend," said Sir Percy, speaking more especially to Déroulède; "if you only knew how simple it all was! Gold can do so many things, and my only merit seems to be the possession of plenty of that commodity." "Percy," whispered Armand, "Marguerite does not know?" "Of course she does not, you young fool," retorted Percy lightly. "If you try and tell her I think I would smash your head." "You see, my dear M. Chambertin," the voice which he dreaded most in all the world said suddenly in his ear, "I would not forgo the pleasure of bidding you au revoir." What is it about Chauvelin that interests me so, and has intrigued many for years? Firstly, I believe, is his resolve. He has set out to accomplish something, and will achieve it at all costs. It is horribly fascinating to watch how coldly and cruelly he sets the trap for Marguerite, and how nonchalantly he quietly takes the knowledge of the demise of her entire world, and leaves. Chauvelin, from the 1934 movie adaption. He had received a rebuke and a snub, but his shrewd, fox-like face looked neither abashed nor disappointed; on the contrary, a curious smile, half sarcastic and wholly satisfied, played around the corners of his thin lips. This man, this Pimpernel, who Marguerite has so idolized, is eventually known to him to be none other than her own husband. Yet Chauvelin had a purpose, something greater in his mind than the ties of an old friendship, or love, as was the case of the 1982 adaption. Chauvelin, from the 1982 movie adaption. But, above all, Chauvelin had a purpose at heart. He firmly believed that the French aristocrat was the most bitter enemy of France; he would have wished to see every one of them annihilated: he was one of those who, during this awful Reign of Terror, had been the first to utter the historic and ferocious desire “that aristocrats might have but one head between them, so that it might be cut off with a single stroke of the guillotine.” And thus he looked upon every French aristocrat, who had succeeded in escaping from France, as so much prey of which the guillotine had been unwarrantably cheated. 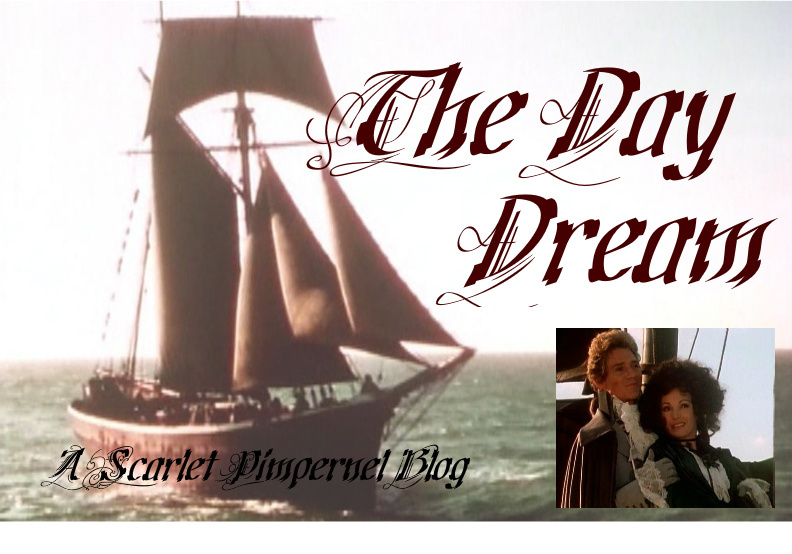 In fact, I think in the 1982 movie version, there was another current running in Chauvelin’s desire to kill The Scarlet Pimpernel once he finds out it is really Sir Percy Blakeney… it is, perhaps, a means to get back at Marguerite, for spurning him, for marrying a fool. She… she would never know anything different. In her eyes, he should die a fool. That moment when you see his love for Marguerite, his disbelief that she could possibly marry Sir Percy, of all people. She looked at [Chauvelin] as he turned to speak to Desgas; she could just see his face beneath the broad-brimmed, Cures’s hat. There was at that moment so much deadly hatred, such fiendish malice in the thin face and pale, small eyes, that Marguerite’s last hope died in her heart, for she felt that from this man she could expect no mercy. He, above all, longed to have the cunning enemy, who had so long baffled him, helpless in his power; he wished to gloat over him, to enjoy his downfall, to inflict upon him what moral and mental torture a deadly hatred alone can devise. The brave eagle, captured, and with noble wings clipped, was doomed to endure the gnawing of the rat. Or so Chauvelin thought. As he meets Sir Percy face to face, near the end of their journeys, we find he really is frightened of the man. He has met his match in wits, a man so clever and daring that he seemed almost able to accomplish the impossible. He had no fear for his own person, although he certainly was alone in a lonely inn with a man who was powerfully built, and who was daring and reckless beyond the bounds of probability. Chauvelin would willingly have braved perilous encounters for the sake of the cause he had at heart, but what he did fear was that this impudent Englishman would, by knocking him down, double his own chances of escape; his underlings might not succeed so well in capturing the Scarlet Pimpernel, when not directed by the cunning and and the shrewd brain, which had deadly hate for an incentive. Unfortunately, it is Chauvelin’s complete faith in his preparations that allows the Pimpernel to ultimately slip right out from under his nose. He is a good villain, certainly, and even more so in the 1982 movie adaption. His love that eventually turns to hate makes him sympathetic to the reader, yet his heartless cruelty makes us root that much more for the Pimpernel and cheer at Chauvelin’s demise. What do you like about Chauvelin? Which representation (movie or book) of him did you like the best?